Each chapter of John Rember's MFA in a Box can be read in the time it takes to travel between Finchley Central and Leicester Square station on the Northern Line of the London Underground. I know because I read it this way. At least, I read full chapters on the days I could claim a seat. Other days, I read what little I could at the distance of two inches from my nose, using the book as a v-shaped shield against the armpits of businessmen's suit jackets as they made their way into the The City to plan the next financial collapse. A recent transplant to London from a rural town in California, I was following the "when in Rome" adage--immersing myself in written ideas to transcend the fact of my animal body crammed in with the warmth and smell of my fellow humans in a speeding subterranean metal box. Each article in the tabloids unfurled all around me had been engineered to be read in the length of one tube stop. By a precise mix of fact and moral opining, they were also designed to provoke an "Isn't that terrible?" reaction, before being discarded in the overflowing waste bins at the top of the stairs. I met John during my first residency in the Pacific University MFA in Writing Program. It was less than a year after the death of our infant son. John gave a talk that was to become chapter eight, about The Book of Job, and Leviathan, and why one should "go deep" in the process of writing--as "conscious dust" in a cosmos that we can only pretend to control, wrapping our arms around the big human questions because we are human, and questioners, and big and deep at our core, despite our cultural contract that says we should instead keep lacquering the surface. Here was someone I knew I could talk to, and I found in our conversations what came back to me, in John's voice, through this book: depth and sensitivity; compassion and quick, wry humor; a willingness to embrace life's irony, and a fierce commitment to make of one's life good art. More than once, while reading this book, I found myself smiling--or was it wincing?--with what Rember calls the "shock of recognition." The narrator in my mind jotted down the sudden change of expression--mine the only upturned mouth in a long row of slackened faces. For all the written attempts at journalistic provocation, I seemed to be the only one in our high-speed, newspaper-lined birdcage who really felt anything at all. I would emerge onto Charing Cross Road, lined with as-yet-still-surviving small book shops, enter the cafe where the Italian woman at the counter looks down whenever she meets my gaze, and past the homeless man in the "God Loves You" denim jacket, smiling into the eyes of each passer-by to wish them, "Good morning!" He sells copies of The Big Issue, a current events magazine that helps people experiencing homelessness to earn their way off the streets. I think of John and his book, comfortable with big issues, and unafraid to look me, as a writer and person, straight in the eye. My only qualm I have with the book is its title. Rember's unique mix of philosophy, depth psychology, and artistic vulnerability is anything but "in a box." Nor is it much like a traditional MFA in itself. 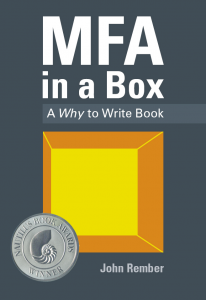 Instead, every writer who has honed their craft through an intense period of writing--be that a formal MFA program or something else--should pick up this book from the other side of those newly-won skills, to rediscover them as survival skills, both for writers individually, and perhaps for our world. Rember's "why to write" book is a memoir of the creative heart and mind in conflict with itself, which is to say a universal struggle that any artist will recognize. More than this, he emerges triumphant over big issues--family, violence, bearing witness, estrangement, grief. Gilgamesh, "Hansel and Gretel," Greek mythology and Paris Hilton all figure in to his survey of literature and culture, teaching through the age-old workshop mantra of showing, rather than telling us, what good, deep writing is all about. More than a review, this is an open thank-you note to John for giving me this life raft of a book, which is about how to live as a writer, go deep in a shallow world, and not only survive but, at least as an artist, thrive. Categories: Books, Life, Poetry, and Travel. Tags: John Rember, London, and The Economy.